In this guide we introduce the Elasticsearch (ES) integration for Shopware. Shopware uses the official PHP low-level client for Elasticsearch elasticsearch-php as well as the ONGR Elasticsearch DSL library ElasticsearchDSL that provides an objective query builder. sw:es:analyze Helper tool to test the integrated analyzers. sw:es:backlog:clear Remove backlog entries that are already synchronized. sw:es:backlog:sync Synchronize events from the backlog to the live index. sw:es:index:cleanup Remove unused Elasticsearch indices. sw:es:index:populate Reindex all shops into new indexes and switch the live system alias after the index process. sw:es:backend:index:populate Reindex all documents for the backend. sw:es:backend:sync Synchronize events from the backend backlog to the live index. sw:es:switch:alias Switch live system aliases. You can find a installable ZIP package of this plugin here. To index data into ES, the BlogMapping, BlogDataIndexer and BlogProvider are required. The english_analyzer field uses, at indexing and search time, a pre configured english analyzer of ES. The getType function defines the unique name for the data type, in this example blog. The populate function is responsible for loading all blog entries into ES for the provided shop. Since the shop indexer doesn't know how to iterate the DataIndexer rows, the iteration has to be inside the populate function. A progress can be displayed using the provided ProgressHelperInterface. First, the function selects all blog ids for the provided shop and passes them into the index function. To separate data indexing and data loading, the BlogIndexer loads blog data using his own BlogProvider. Note: Shopware creates a index for each shop, to separate language specify data. This prevents a language mixing inside an ES index. Otherwise, the search term might be mixed, and a search couldn't be limited to the shop the user is currently browsing. This means that each indexer has to index the data directly in the provided shop language. The shop can be accessed using the provided `ShopIndex` class. Additionally, all restrictions to customer groups, shops or others have to be indexed too. To keep the blog entries up to date, it is required to synchronize the blog data when changes are made. By default, Shopware traces changes using doctrine events. The first step to synchronize blog entries is registering the ORMBacklogSubscriber service. It subscribes to Doctrine's onFlush and postFlush events, in order to trace data changes. The BlogSynchronizer implements the SynchronizerInterface, requiring a synchronize method implementation, which has a ShopIndex parameter to define which ES index has to be synchronized, and an array of Backlog structs which has to be processed. A Backlog struct contains the saved payload, which contains, in this case, the blog id. After all blog ids are collected, the implementation provides them, with the ShopIndex, to his own BlogIndexer to index these ids again. By filtering the selected blog ids using the filterShopBlog, the BlogIndexer gets only ids for the provided shop. This logic can be placed in the BlogIndexer too, which is a detail of each implementation. By implementing the ProductSearchInterface, it is required to implement a search function with a Criteria and ShopContextInterface parameters. This function is the only public API of this class and has to return a ProductSearchResult. The product search should be executed using the original ProductSearchService, therefore the function calls the search function on the decorated service to get access on the original search result. After the product search has been executed, it is required to check if the provided Criteria class contains a search condition. If the criteria contains no search condition, the criteria class contains only filter parameters like categoryId: 10; filterValues: [1,2]; .. which are used to define products list, like category listings or sliders, and the function has to return, at this point, the original product search result. ES searches are executed using official client Elasticsearch\Client. [shortDescription] => This summer is going to be colorful. Brightly colored clothes are the must-have for every style-conscious woman. [longDescription] => This summer is going to be colorful. Brightly colored clothes are the must-have for every style-conscious woman. Whether lemon-yellow top, grass-green chinos or pink clutch – with these colors you will definitely be an eye catcher. And this year we even go one step further. 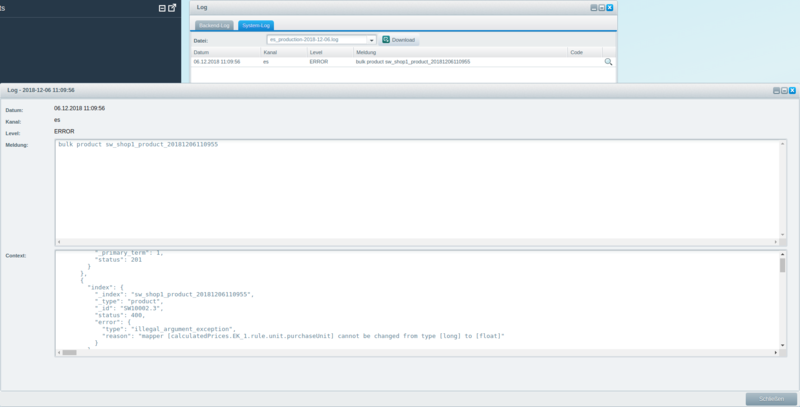 The get function has to return a nested array which will be provided to the Elasticsearch\Client::putSettings API. This blog_analyzer contains definitions for a new custom ES analyzer, which contains only a lowercase token filter, which means that all input data will be lowercase. In case they were configured prior to indexing, Shopware provides a small tool to test analyzers. For more information about analyzers refer to Analysis API. Another common use case is to extend the indexed product data with additional plugin data, to extend listing filtering or query optimization. The following example shows how to extend product data with additional fields. To display this data in the storefront, it is necessary to add a FacetResultInterface to the ProductSearchResult. This can be done by implementing the Shopware\Bundle\SearchBundleES\ResultHydratorInterface interface, which requires the class to implement a hydrate function. Like the SalesFacetHandler, the SalesConditionHandler implements the Shopware\Bundle\SearchBundleES\HandlerInterface to handle parts of the criteria. The supports function returns true if the provided CriteriaPart is a SalesCondition. After the filter is created, it is required to check if the filter should be added as normal filter or as a post filter. This can be checked using the criteria object, by using the hasBaseCondition function. If the criteriaPart is a BaseCondition, the filter has to be added as normal filter, otherwise as post filter. Like the other handlers, the SalesSortingHandler handles a CriteriaPart, so it implements the Shopware\Bundle\SearchBundleES\HandlerInterface. To sort the search result, the ONGR\ElasticsearchDSL\Sort\Sort class can be added to the provided ONGR\ElasticsearchDSL\Search. This behavior is now controlled in the \Shopware\Bundle\SearchBundleES\ProductNumberSearch. To support the new filter mode, each condition handler has to implement the \Shopware\Bundle\SearchBundleES\PartialConditionHandlerInterface. It is possible to implement this interface alongside the original \Shopware\Bundle\SearchBundleES\HandlerInterface. In Shopware 5.5.5 we added an elasticsearch logger which logs several ES requests and their responses. In addition to that, you'll get an evaluation of the indexing process after each step by default. As already mentionend do these options work with both, the sw:es:index:populate and the sw:es:backend:index:populate command. An occured error can be viewed in detail via the system log backend view (Configuration > Logfile > System log) by selecting the correct ES logging file (something like es_production-2018-12-06.log).